An energy efficient home begins with the actual location of the property. Depending on the aspect on the section and the surrounding features, Greentech will then create a design that maximises the natural location of the property. The main aim is to have an elongated property, with the main windows facing north towards the sun. Rooms that need early morning heating or afternoon coolness should be in the east of the house, while rooms used in the evening will be located on the west side. Other shaped properties (like L & U shapes) allow sheltered areas and protection from cold prevailing winds. Houses consume nearly 35% of the total electricity generated in New Zealand. Unfortunately the majority of New Zealand homes do not use energy efficiently. The key element to the construction of energy efficient homes is airtight construction and high levels of insulation. Older homes tend to lose a large amount of heat, requiring expensive and energy consuming reheating to remain warm. A sealed house will retain much more heat. Some of the materials and techniques used by Greentech are low emission double-glazing and thermal breaking of materials. High quality double- glazing on windows makes a huge difference to the warmth of a home. The glass we recommend at Greentech Design allows the solar energy in, but prevents it from escaping as well. Thermal breaking of materials means identifying poorer insulating materials used in the construction, and using an additional insulating material to reduce heat loss. Effective insulation complements air tight construction. Again this requires an intelligent approach. The right insulating material needs to be used in the right place. Aiming for higher insulation values in the home results in greater energy efficiency, and a more pleasant place to live in. A new name for Greentech Homes is Energy + Homesand will be show cased at the Canterbury Home Show from 17th to 19th October 2014. 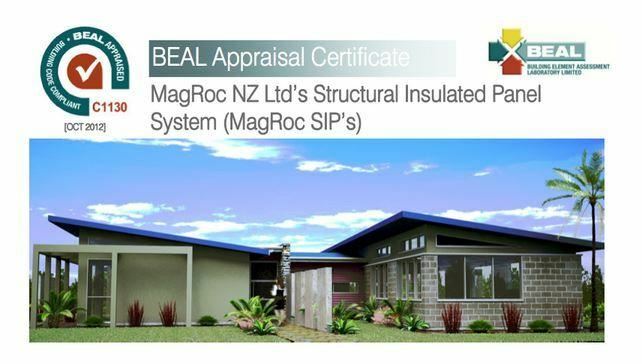 MagRoc NZ Ltd Building systems have been issued with Appraisal and code-mark.